Can we all just get along? That question seems logical when looking at the world created by writer/director James DeMonaco. The sequel, The Purge: Anarchy, to last year's surprise hit, The Purge, indicates that our world is in more trouble than we expected. We pick up a year later, on March 21, 2023, after the events of the first movie, which took place inside the confines of an upscale family's home. The new setting has shifted the events outside and into the city. 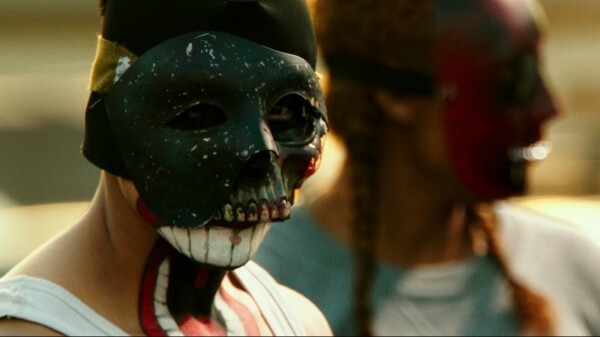 It's less than 2 hours before the Annual Purge commences, when all crime will be legal for 12 hours. A couple (Zach Gilford and Kiele Sanchez) are driving home when their car breaks down, minutes before the sirens go off. 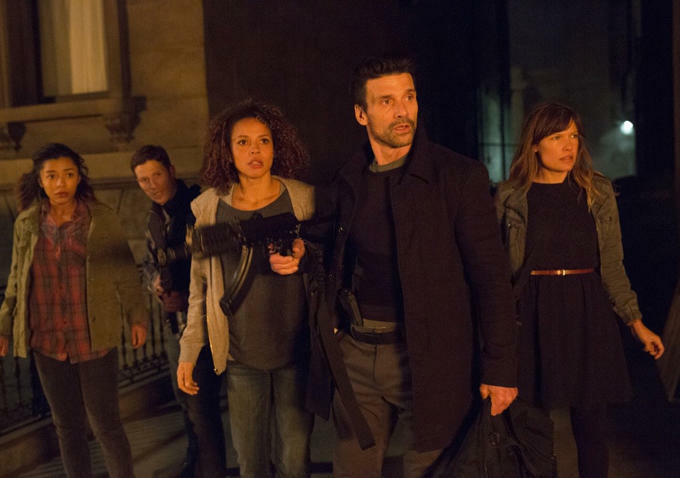 Meanwhile, a police sergeant (Frank Grillo) goes out into the streets to seek revenge on the man who killed his son, and a mother and daughter (Carmen Ejogo and Zoë Soul) run from their home after assailants destroy it. The five people intersect as they attempt to survive the night in Los Angeles. DeMonaco takes the clever and interesting premise that was established in the first movie and expands upon it in interesting and unnerving ways. This is a sequel that improves on the first installment, which started strong, but did not deliver all the way on the unique concept due to the story being restricted by the home setting. Moving the events to the streets allows the story to follow multiple threads and allows new elements of danger to enter the world. The tension is lifted higher and we view how average people would deal with being stuck outside and vulnerable in a crazy circumstance. The manner in which the characters cross paths and are forced to join together is well-executed and feels plausible for the audience to accept. DeMonaco is able to skewer the class differences more so than in the previous movie, by portraying the gap between the poor and rich in a darkly satirical way. This element is personified by the character named Carmelo (Michael K. Williams), a rebel leader of the disenfranchised. The pacing is stronger this time around, compared to the first movie. Since the concept is already familiar, DeMonaco plunges the audience rather quickly into the action. The forward momentum of the events creates genuine suspense throughout the running time. There are some surprising turns in the story that keeps the viewer on edge. He creates some effectively chilling sequences that allows the audience to feel the raw nature of the annual night. DeMonaco portrays the violence in manner that is not gratuitous or gory, but still gritty enough that the brutality of the night is not lost. He also does an efficient job of establishing the characters enough for the audience to have some investment in their outcome. All of the actors are solid in their performances, but Grillo is a standout in a mostly silent role. He plays someone who is carrying the weight of tragedy and his strong, brooding presence is put to compelling use. Though the movie does better the original in many aspects, there are some flaws that keep it from being a stronger experience. The critique of the rich and poor is well-presented, but not developed further to raise the movie beyond action/thriller levels. The political elements are also thought-provoking, but not taken further to truly make the impact necessary of the violence being portrayed. Also, since crime is legal during this occasion, DeMonaco decides to focus just on murderous crime. Why not also focus on other types of crimes being committed. Despite its flaws, the movie delivers a past-paced thrill ride that also expands the world previously established. I appreciate a summer movie that is interested in more than just displaying action sequences, but also asking moral and thought-provoking questions as to why our society is allowing such violence to exist. DeMonaco is presenting a society that is eerily close to ours and plumbing our primal urges to extreme effect. I look forward to where the series goes and where we purge next. Strong performance by Frank Grillo. Expands the world of The Purge to forceful use. Action is thrilling, but not gratuitous. Great concept that will mine future installments. Concept not expanded beyond murderous crime.